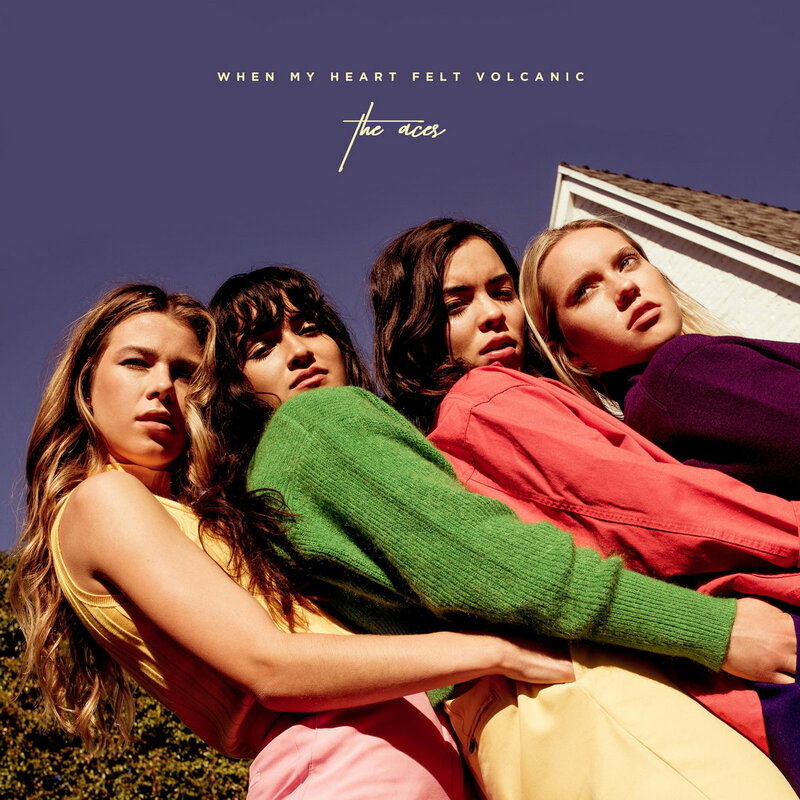 The Utah based four piece The Aces has released their debut full length When My Heart Felt Volcanic, a glimmering pop record that showcases their tween ready voices over heavy production and huge choruses designed to be played at festivals in the very near future; a tour opening for Haim cant be far off. The group, Cristal Ramirez lead vocals/guitar sister Alisa on drums, Katie Henderson lead guitar and McKenna Petty bass (shockingly no keyboard/piano playing credit?) are crafting tunes with new wave appeal yet clinically produced for the goal of gaining an iPhone ad. Dreamy vocals, digital effects, hand claps and dance ready beats are everywhere. Opener "Volcanic Love" gets the whole neon drenched party started and while the early twenty year old band may have been through ups and downs, the lyrics deal more with lighthearted loves and tshirts that don't look good on them anymore. All of the songs continue in this fashion with various degrees of success "Stuck" pushes up the dramatics while "Lovin' Is Bible" pulls in light funk and modern day R&B in the vein of Bruno Mars as the group wants to watch their love go viral. Both "Just Like That" and "Holiday" rev up the dance vibe with electro keys and the singalong choruses while "The Last One" is a smiling upbeat kiss off tune. "Fake Nice" is the best of this bunch incorporating pieces of Prince, Justin Timberlake and Lorde complete with a vocal/lyrical breakdown. The chicken scratching guitars, dance laden bass groove and skittering clapping drums swirl into pure pop perfection complete with warbling guitar effects and light keyboard touches. This track is unimpeachable, but this also causes some of the reservations with the rest of the album. The Aces worked with six producers over the thirteen tracks including Dan Gibson and Simon Oscroft and in the end When My Heart Felt Volcanic comes off as an algorithm inspired collection of tracks to be shared on social media to garner clicks, likes, festival slots; easily digested/forgotten. The band is professional, the layers and layers of sonics are robust, the singing is clear, but the true connection/emotion somewhere, somehow gets lost. Pop music can be effective and affecting, this being their first full length it is impressive that The Aces manage to achieve one of these. A stripped down piano based number like "Hurricane" proves that the quartet has more to offer, but the pop waters they float in toss out as many tunes as possible hoping one floats to chart success. Red Bull Records will hype, commercials will get new soundtracks and The Aces could soar on the back of the clinically strong album. If the chips fall for them a Grammy (their goal) could be in their future, but here's hoping a bit more of life infects their next release.